Iyad Hayatleh is a Palestinian poet, translator who was born and grew up in Syria. He started writing poetry early and published his work in Arabic magazines, giving many readings in Syria, Lebanon and Yemen. He has lived in Glasgow since 2000, and he is now an active member of Scottish Pen and Artists in Exile Glasgow and has taken part in many cultural events and translation and poetry workshops giving many readings in Glasgow, Inverness, Belfast, Wigtown, Aberdeen, and Edinburgh International Book Festival, and published some of his poems in Magazines and collective pamphlets in Scotland, and has his first collection published by Survivor’s Press, called Beyond all Measure. He has collaborated with poet Tessa Ransford, on a two-way translation project for a book, A Rug of a Thousand Colours, with poems inspired by the Five Pillars of Islam, published by Luath Press, Edinburgh in September 2012. 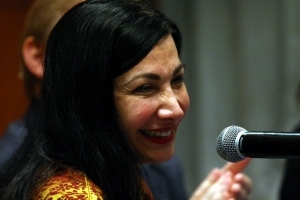 Born in Latakia, Syria, Maram al-Masri ( مرام المصري ) is a contemporary poet and writer. After studying English literature at Damascus, she moved to Paris in 1982. At present she dedicates herself exclusively to literature and translation. Besides numerous poems published in literary journals, in several Arab anthologies and in various international anthologies, she has published several collections of poems. Thus far her work has been translated into eight languages. 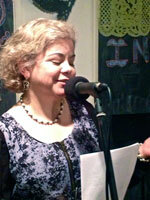 Maram al-Masri has participated in many international festivals of poetry in France and abroad. She has been awarded the following prizes: “Adonis Prize” of the Lebanese Cultural Forum for the best creative work in Arabic in 1998, “Premio Citta di Calopezzati” for the section “Poesie de la Mediterranee”, “Prix d’Automne 2007” of the Societe des gens de lettres. Numerous translations of her work from the Arabic include A Red Cherry on a White-tiled Floor (Translation by Khaled Mattawa, Bloodaxe Book Editions, Newcastle, 2004, Second edition printed in 2005, Third edition printed in 2007, US Copper Canyon Press). Author, editor and translator of a selection of creative, political and autobiographical books including:Poisoned Kohl (Poetry and short stories), Introducing Slafoj Zizik (translation), Country of Words(translation and editing), A History of Injustice in the Arab World (editing). Vice president of the Syrian Writers Association, Managing Editor of a ‘Awraq’ magazine (London), founder of a (Al-Wa’I) Publishing House, Co-founder of the Syrian Journalist Association, co-owner of Artiquea Gallery (London), Many times a contributor to debates in universities, conferences, TV programs and workshops. 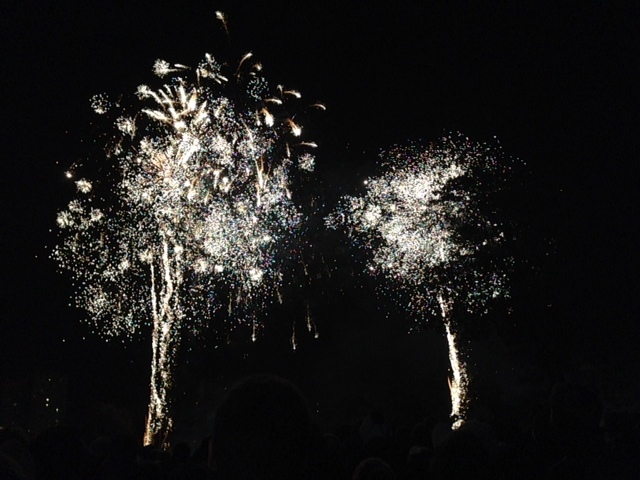 An explosive evening of new work by exiled writers – edited in a two-way process of exiled writing into English and English work into exiled writers’ languages. But does peace always suggest the absence of agitation or conflict? The word is sometimes used in reference to silence. What does Runyararo mean to the ordinary Zimbabwean today? Dumi Senda is a Zimbabwean-born internationally acclaimed poet who who will read from his newly published collection: When the Soul Awakens.He performed in honour of Nelson Mandela at the invitation of the BBC and has been a guest speaker at the UK Houses of Parliament and the UN, Geneva. He is renowned for his humanitarian activism and extensive work to inspire communities and young people across the globe. Handsen Chikowore has written many poems about human rights. His ‘Cry African Girl’ was published in more than 200 magazines and newspapers and he has graced the Poetry Cafe with his poetry on several occasions. Belinda Zhawi is a writer and Politics student from Zimbabwe and a decade long resident of London. She has performed across the UK at festivals and events including Bestival, Big Chill, Tongue Fu and Poejazzi. Her work has been published in the 2012 anthology Liminal Animals, alongside some of her poetry heroes. She is an active member of Rubix Collective, and has had work featured and credited on their 2012 album, Red, a Roundhouse Records release. He is a producer, director, singer and songwriter, who has in the past 18 years performed in 30 countries sharing stages with Jimmy Cliff, Peter Gabriel and Naughty by Nature. He has appeared on such programmes as Blue Peter, Later with Jools Holland, prime time on City TV-Toronto and venues such as the JFK Centre in Washington DC, Opera de Paris and Ronnie Scotts. 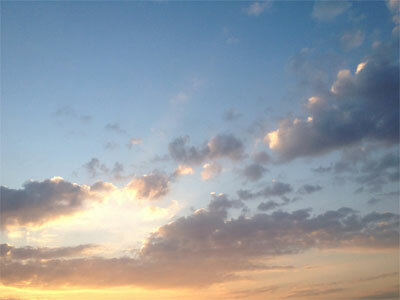 Lucky passionately, argues for music as a vehicle for change, communication, dialogue, healing and problem solving. Vesna Goldsworthy’s most recent book, Crashow prize winning collection, The Angel of Salonika, was one of The Times best poetry books in 2011. 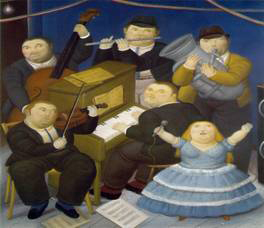 Nikola Cobic was born in Belgrade. He writes poetry and short stories and is the guitarist in the London based group, Princip. He was an editor of a poetry magazine The Wolf. Sonja Besford was born in Belgrade. She has nine published books. She lives in London with her first husband. They will also talk about their favourite Serbian writers: Kiš, Crnjanski, Miljković, Mihajlović, Pekić & Petrović. There will then be discussion. 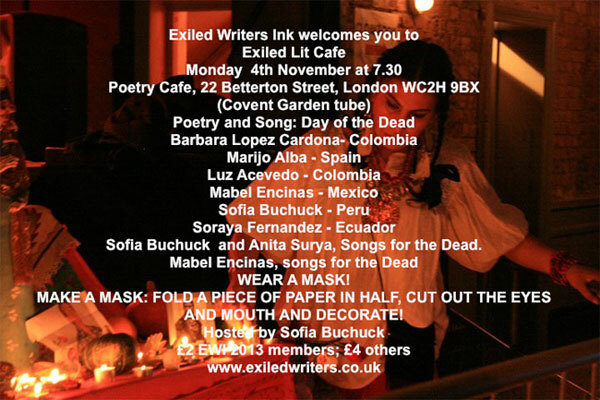 Freedom from Torture’s ‘Write to Life’ group visits Exiled Writers Ink, with a programme of stories, poems and other inspiration for dreamers in exile here in London. Khayke Beruriah Wiegand will read from her collection of poetry: Tsi hot ir gezen mayn tsig ? un andere lider – Have You Seen My Goat ? And Other Poems, Tel Aviv : H.Leyvik-farlag, 2012. For many years she has been writing poetry in Yiddish and has published her poetry in various Yiddish publications in New York, Paris, Florence and Jerusalem.She is also a translator from Yiddish and has published a bilingual edition of A.N. Stencl’s early verse, co-translated with Stephen Watts (Five Leaves, 2007), as well as a translation of a book of memoirs by the Grodno writer Leib Reizer (Yad Vashem, 2009). She is the Woolf Corob Lector in Yiddish at the Oxford Centre for Hebrew and Jewish Studies (University of Oxford). Both Professor Sahar Hammouda, visiting from Egypt, and Dr. Jay Prosser are writers of memoirs, but while Sahar’s memoir is set in Jerusalem from where her family had to flee, Jay’s memoir-in-progress is the narrative of Iraqi Jews who left Iraq to follow the trade routes of the British Empire. Sahar and Jay will be in conversation. 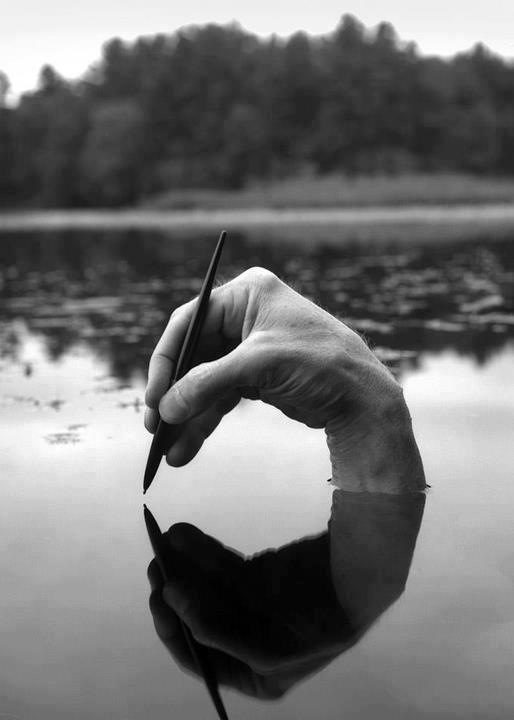 Contemporary Jewish Exiled Writing; The Silver Throat of the Moon: Writing in Exile; Crossing the Border. 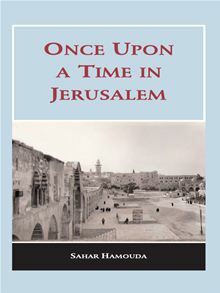 Sahar Hamouda’s Once Upon a Time in Jerusalem is the saga of a Palestinian family living in Jerusalem during the British mandate, and its fate in the diaspora following the establishment of the state of Israel in 1948. Told from the perspective of a mother and daughter, the book shows Jerusalem from a new perspective: a cosmopolitan city where people from all nations and faiths worshipped, married and lived together, until such a co-existence ended and a new order was enforced. Jay Prosser’s memoir-in-progress, Love and Empire: A Family Story, tells the story of the diaspora of Baghdadi Jews and their subsequent sojourns, and intermarriages, in India and then in Singapore. Using music as a key motif for capturing memory and migration, Prosser is discovering family stories that repeatedly show Jewish identity as thoroughly meshed with transcultural openness: towards Iraq, towards India and indeed towards a distant Arabian past. In any multicultural and healthy society, the voices of minorities and individuals and thinkers may express diversity of opinion and thought, find freedom of assembly, the right to protest peacefully, unlike Zimbabwe, from where Paul Davey, writer and photographer heralds as does Bart Wolffe who is hosting the evening as well as musician/writer Taku Mukiwa. This is the very basis for the organisation, Exiled Writers Ink; to provide a platform for those whose freedom of expression has been curtailed in their former homelands. 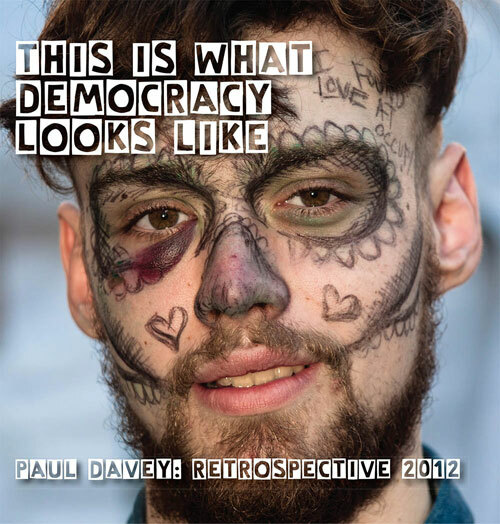 Paul will be doing a presentation of slides accompanied by a talk from his recent book, This Is What Democracy Looks Like. He will be accompanied by Fiona Sze-Lorrain, writer and translator, Iraqi poet, Adnan Al-Sayegh, Nigerian born poet Chinwe Azubuike and Zimbabwean Mbira authority Taku Mukiwa. There will also be a short open-mike session after the question and answer discussion at the end of the evening. Fiona Sze-Lorrain writes and translates in English, Chinese and French. Born in Singapore, she grew up in a hybrid of cultures. After receiving a British education, she moved to the States and graduated from Columbia University and New York University before obtaining her PhD from Paris IV-Sorbonne. Her new collection of poetry,My Funeral Gondola, is published as a Mãnoa Books title by El Léon Literary Arts in 2013. Her debut poetry title, Water the Moon, appeared in 2010. In addition to her books of translation of contemporary Chinese poets from Zephyr Press, and prose translations of Hai Zi forthcoming from Tupelo, she has translated Ghérasim Luca and American poet Mark Strand. She has co-edited Sky Lanterns: New Poetry from China, Formosa and Beyond (2012) and On Freedom: Spirit, Art and State (2013), both from the University of Hawai‘i Press/Mãnoa. With Gao Xingjian, she co-authored Silhouette/Shadow: Cinematic Art (Contours, 2007). A co-founder of Cerise Press, and a contributing editor of Mãnoa: A Pacific Journal of International Writing, she currently works as an editor at Vif Éditions, an independent French publishing house in Paris. Also a zheng harpist, she has performed worldwide. Her CD, In One Take, was released in 2010. Chinwe Azubuike is a contemporary African Poet, born in Lagos-Nigeria. Much of her work explores the relationship between traditional beliefs and modernity. Her poetry highlights the complicated issues and beauty of the people of Africa, often focusing on female issues; of love, life and torture with specific references to ethnic family traditions. Chinwe believes that culture is alive and as a poet, sees herself as part of a process of renewal. She has collaborated with artists in installations and exhibitions at a number of venues including the Victoria and Albert Museum, London. Taku Mukiwa is a Zimbabwean musician who writes an Mbira blog which disseminates news and views on this very traditional African instrument especially as it is seen and adopted in countries ranging from Japan to the USA. He will share his vision on how this little-known musical form is an ancient voice that he is ensuring can be heard in the wider contemporary society of multiculturalism and adds to the broader picture of a democratic ideal. Adnan al-Sayegh one of the most orginal voices of the generation of Iraqi poets that came to maturity in the 1980s,was born in al-Kufa, Iraq. In the 1980s he was conscripted in the Iran-Iraq war and in 1993 his uncompromising criticism of oppression and injustice led to exile in Jordan and Lebanon. On the publication of ‘Uruk’s Anthem’, he was sentenced to death in Iraq and took refuge in Sweden. Eleven collections of his poetry have been published in Arabic and The Deleted Part in English (Exiled Writers Ink 2009). Adnan has received several prestigious international awards. Taking part in the international poetry action launched by The World Poetry Movement (www.wpm2011.org), the movement is composed of 250 festivals and poetry organisations and 1350 poets from 131 countries. Colombia is experiencing one of the greatest humanitarian tragedies on earth. This conflict has claimed more than one million lives and has left behind an even greater number of the population wounded, maimed, disappeared, imprisoned or exiled. Peace in Colombia, a country that deeply loves poetry, is a must more than ever before. This poetry initiative was launched by Fernando Rendon, poet and director of The International Poetry Festival of Medellin, Colombia, Alternative Nobel Prize 2006. Ruth is a British poet and writer. She has published a novel, eight books of non-fiction, including three on reading poetry and eight poetry collections:most recently the The Mara Crossing, an exploration of migration and displacement in poetry and prose. . She also presents Radio 4′s Poetry Workshop. Her awards include First Prize in the UK National Poetry Competition, a Cholmondeley Award from The Society of Authors, an Arts Council of England Writers’ Award and a British Council Darwin Now Research Award for her novel Where the Serpent Lives. Is a writer, poet, public speaker, and broadcaster on a number of topics. He has been trustee of the Poetry Society and Planet Poetry and is a trustee of English PEN. Raficq was awarded an MBE for his interfaith work. He has published two books of poetry based on the Muslim mystics poets Rumi and Attar. Author of several collections of poetry, including Morning Breaks in the Elevatorand Rebel Without Applause, he is also editor ofThe Fire Peopleand a performance pioneer. His broadcasting work is extensive – including regular appearances on BBCRadio’s 1, 4 and 5. He is an associate artist at the Southbank Centre. Was born in Medellin, Colombia. She started writing poetry at school as a way of expressing her feelings and thoughts. Antonio Riva is a singer and guitarist and his musicians play original arrangements of traditional folk songs from South Eastern Europe and the Mediterranean area. The band comprises guitarist Antonio Riva, accordionist Ana Reisinger, clarinettists Clare Southworth and Liam Fionescu, cellist Kat Henderson and percussionist Seppi Pogadl. Yasin Aziz is from the town of Halabja in South Kurdistan, Kurdistan Regional Government, North Iraq and came to England in 1984. He worked as a civil servant with the Inland Revenue for about 10 years. He started writing in 1988 after the bombardment of Halabja. He has published books in Kurdish, had poetry published in England and translation, reviews of books and articles published online about various topics in English and Kurdish. He recently completed a historical novel about the Kurds. Maria Eugenia Bravo Calderara is a Chilean writer in exile. Her poetry collections are entitled Prayer in the National Stadium (London 1992) and Poems from Exile (Exiled Writers Ink, 2008). In 1993 in Chile she published a book about Pablo Neruda’s poetry. Her short stories have been published in Chile and Spain while her poetry has appeared in anthologies published Europe-wide. Victor Schonfeld is an award-winning filmmaker and more recently a prose fiction writer. He is renowned for a range of controversial films on hitherto taboo subjects. Long time resident in London, Schonfeld was born and raised in the USA. 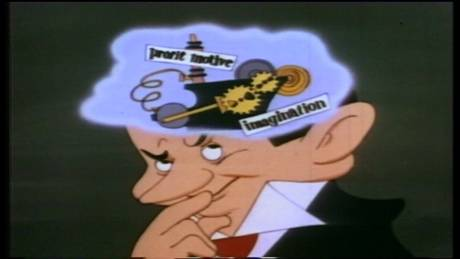 He will show part of his ITV network documentary MoneyLove which scrutinises the compulsive pursuit of wealth in his homeland, America, as seen through the prism of an expatriate, and he will be reading a short story in which he engages with related themes. He is an award-winning poet, novelist and short story writer. A native of war-torn Afghanistan, he has lived in Europe, Asia, Africa and Central America and worked for international organisations such as the United Nations, European Union, Asian Development Bank, International Red Cross and NGOs. Sakhawarz lives with his family in Geneva. 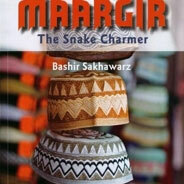 He has just published his novel, Maargir, the Snake Charmer (Oct. 2012). Extracts from the theatre production The Arab Nights. Hassan Bahri was a mechanical engineer and political activist in Syria and was imprisoned there for over eight years. In 2001 he came to the UK where he is a freelance translator and also writes articles for Arabic newspapers. He has published a collection of short stories in English: ‘Bread Heap and a Dreamer’. She is a Syrian poet and writer whose father is a political prisoner. 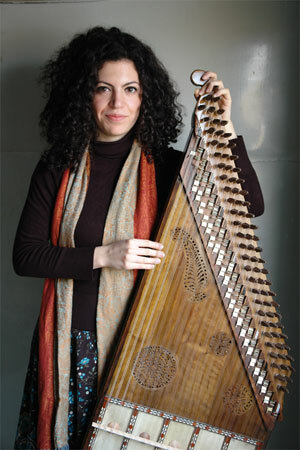 Syrian Kanun player Maya Youssef comes from a family of artists. Her musical appreciation and education started when she was just a child. Maya’s musical renown was already set in motion, when she won the Best Musician Award in Syria’s youth national music competition in 1996. In 2007 Maya completed her BA in Music from the High Institute of Music & Theatrical Arts in Damascus, where she was trained in classical Arabic, Western, Azerbaijani and Turkish Kanun schools. As a renowned soloist or with musical ensembles Maya gave vibrant performances in Dubai, Beijing, Bologna, Amsterdam, Frankfurt and Athens among other vibrant destinations. When Maya moved to Dubai in 2007 she created a buzz around her and attracted the media attention where she gave various TV interviews at leading Arabic TV channels like mbc, Dubai TV, Abu Dhabi TV among others. As an acclaimed kanun expert, Maya was invited in 2009 to teach at Oman’s Sultan Qaboos University in the Department of Music and Musicology, she taught Kanun and Theory of Arabic Music there. In early 2012, Arts Council of England recognized Maya as an Exceptional Talent, which has enabled her to come to the UK to develop her international career and she is currently living and working in London. – Katherine Gallagher was born in Australia and has lived in London since 1979. She has five full collections of poetry, the most recent being Carnival Edge: New & Selected Poems (Arc Publications, 2010). She was a Parnassus poet representing Australia at the Derry Clipper Festival in July last year. – Kristiana Rae Colon is on a special visit from Chicago to promote her poetry collection. She is a poet, playwright, actor, hip-hop artist, and educator. Her short collection of poems promised instruments was launched in Chicago by Northwestern University Press on January 31. The poems in promised instrumentsare also a part of her one-woman show cry wolf which just had a run in Chicago as apart of Teatro Luna’s Solo Tres festival. In autumn, she was in London for the world premiere of her play but i cd only whisper at the Arcola Theatre. – Ziba Karbassi was born in Tabriz, Iran and had to leave in the mid-1980s. She has published seven books of poetry and is widely regarded as the most accomplished Persian poet of her generation. She has performed her poetry extensively across Europe and America. 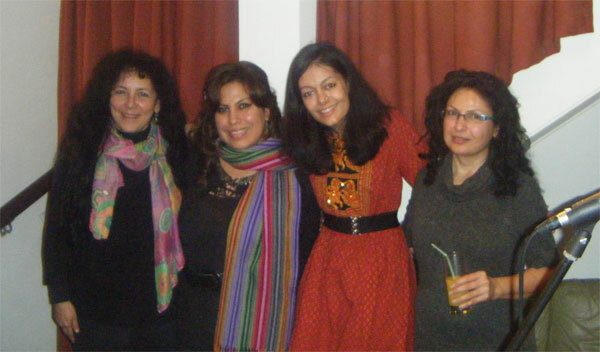 In 2009 she won the Golden Apple poetry prize of Azerbaijan. Her poetry has been largely translated into English by Stephen Watts and into Italian by Cristina Viti. Her collection Poems Poesie was published in 2011 (Mille Gru). – Ali Abdolrezaei was born in northern Iran beginning his poetic career in 1986. His poetic voice is highly original. He published eight books in Iran but in 2002, following his protest against the severe censorship imposed on his work, including Society and Shinema, he was banned from teaching and public speaking. He left Iran settling for two years in France after which he came to London. 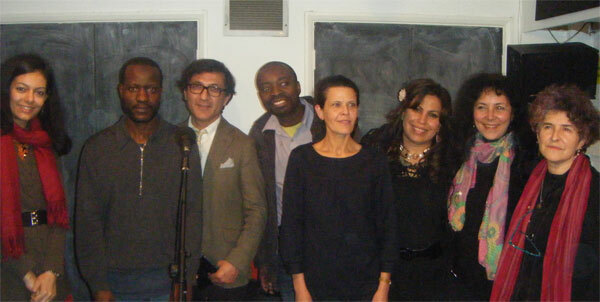 Hosted by Abol Froushan, poet, writer and Chair of Exiled Writers Ink. From Cafes by Abdulkareem Kasid, trans. Sara Halub (2012: The Many Press). Abol Froushan is an Anglo Persian poet, translator and critic, born in Iran, living and working in London. He has a PhD from Imperial College of London, and is currently the Iran Editor of Poetry International Web, and chair of Exiled Writers Ink UK. Abol’s poetry has been reviewed as one of phenomenal presence and fresh vision, recording the sudden and re-examining archetypes and universals in microscopic detail. Abdulkareem Kasid, a widely published poet, essayist and translator, was born in Basra in 1946. He left Iraq in 1978, and from 1980 to 1990 he lived and worked in Damascus. He is now settled in London with his two children. He has translated the French poets Prevert, Rimbaud and St-Jean-Perse into Arabic. English translations of his own work have appeared in various UK magazines, includingBanipal, Shadowtrain, The North, Poetry London. Just out from The Many Press is ‘Cafes’, the first extensive publication of his work in English. Fathieh Saudi born in Jordan, she completed her medical studies in France and worked as paediatrician with Palestinian children in Jordan and Lebanon. For many years she has been involved with the defence of human rights, peace and justice. She has written or translated several books. Her recent published collections of poetry in English include Prophetic Children(foreword by John Berger) and Daughter of the Thames. Fathieh was awarded OBE from France. 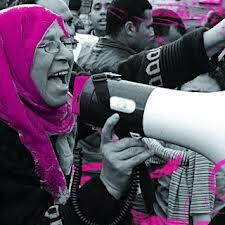 She is board member of English PEN and Exiled Writers Ink. Bart Wolffe is a self-imposed exile from Zimbabwe with a long history of writing, acting, directing and producing for television, radio, filmand theatre throughout southern Africa and has had six of his plays performed in London and Edinburgh. He is also a novelist and poet. Hosted by Jennifer Langer, poet and essayist.